Israeli sources said the soldier was released to spend Pesach with his family in Ramla; his father went to the military base, where his son is held in Ras al-Ein near Tel Aviv, and took him back home, where dozens of Israelis welcomed him in massive celebrations, and chants in support of the killer. Four days ago, an Israeli army prosecutor filed a manslaughter indictment at the Jaffa Military Court against the soldier, Sargent Elor Azaria, for killing Abdul-Fattah Sharif, on March 24 2016, after the Palestinian was already shot and seriously wounded. 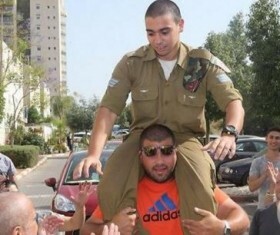 The soldier is also charged with “conduct unbecoming of a noncommissioned officer.” A gag order on his name was lifted after the charges were officially filed, the Jerusalem Post said. Investigations carried out by the army revealed that Sharif was fatally shot eight minutes after his initial injury. He was left bleeding on the ground for the entire time, until Azaria shot the completely incapacitated Palestinian in the head. The execution of the wounded Palestinian was caught on tape by a Palestinian videographer, identified as Emad Abu Shamsiyya, who since then started receiving death threats from many Israeli fanatics, for exposing this crime to the world. Abu Shamsiyya is also a tailor.